Alasdair, you've got new color. Fantastic work. Now we just need to get an API out. Its great if you can put the link in footer. Definitely. The app, while it works well, is useless for me until we can get account access. Plus, the mobile version is pretty solid in the meantime. I've always experienced increases in conversions & downloads whenever I do this. Ah nice! Thanks for the tip. I've changed the urls on the site. Thanks so much for all the kind words everyone. 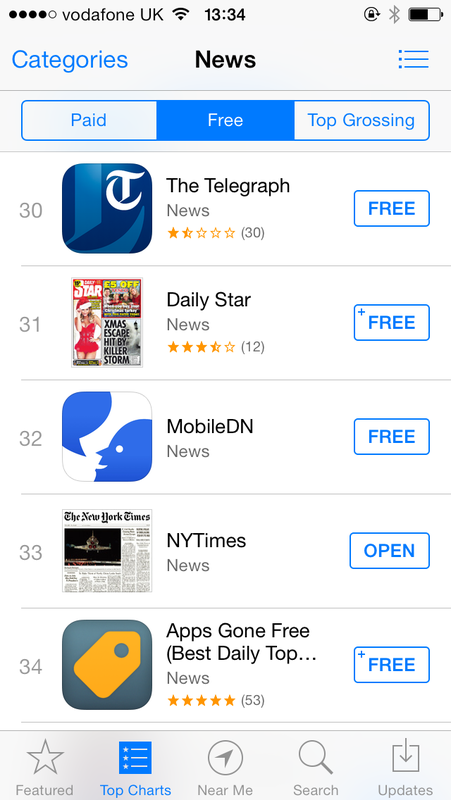 At the moment, Mobile DN is #32 under News in the UK AppStore, which is pretty epic. I've also taken note of feature requests mentioned so far so when I'm next working on it. Great work man! You also deserved a homescreen spot on my phone. Straight onto my home screen! Nice work Al. Hopefully this spurs on development of a DN API. This is also going to my Home Screen. I can now replace the Web App version of DN. I'm also glad you got the comments in. Fantastic work! Great work. Is there any thing similar for Android? How is that that you have 120+ karma, and don't have the "Earned for having 100 Karma" grey color? Great stuff. Thanks for your time and effort. FR: how about our avatars? Is this the most upvoted Post ever on DN? Thanks Alasdair, this is brilliant! Great job and well deserving of a purple colour. Great work! It seems like LayerVault's own app! One little suggestion: Scroll to top of corresponding view when double-tapping on the tab icon at the bottom (just like the tap on the header does). Nice, many thanks to the app creator. Amazing little app, love the TabBar icons! One little nitpick though, is it just me or you can't go back from Search tab without performing a search first? maybe I'm missing something, but is there currently a way to log in and comment through the app? Not currently, as we haven't exposed a proper API. Another Friday or two and we'll have one implemented. How are you doing it without an API? webviews or selenium or something? I believe there's a JSON file somewhere that he's referencing. You can get JSON back for most things on Designer News by just adding ".json" to the end of any URL. There's no formal way to submit information, though. When the API allows for logging-in and commenting, this is gonna be a solid 10. Pretty great. Is this native or cross platform? I was wondering if you were using the same code base as Premii. It's all native ObjC, so no webviews here. Edit * double post, apologies. Brilliant, thank you for sharing!